The Ron and Jane Graham School of Professional Development in the College of Engineering is unique in Canada, offering professional development opportunities in both communication and engineering entrepreneurship. Since its establishment in 2012, the Graham School has provided hundreds of students with a strong foundation in the skills underlying engaged and effective professional citizenship. The Graham School was founded on the principle that “softer” skills such as communication, entrepreneurship, and project management are crucial platforms for superior performance in the technical professions. The Graham School team are dedicated professionals with a wide range of expertise who deliver top-notch education and training to both students and working professionals. The Graham School’s Certificate in Professional Communication is a stand-alone certificate of proficiency that focuses on developing a student’s prowess in communication. Faculty have developed a suite of courses to enhance students’ performance as both industry leaders and as scholars. The Graham School teaches students the art of persuasion and public speaking, both rooted in rhetorical theories of audience and purpose. Writing courses focus on supporting students so that they can develop technical communication skills, learn to write for the public, and cultivate document editing skills. Additionally, the School’s focus on enriching students’ leadership skills is manifested through leadership, interpersonal, and negotiation courses. The Graham School’s Engineering Entrepreneurship Option (EEO) allows engineering students to cap their experience in the College with a suite of skills and knowledge that help them assess, and then develop, their interests and abilities in starting their own business. Students learn the basics of establishing and running a business at the Edwards School of Business, as well as more advanced marketing and entrepreneurship skills, culminating in a project that brings them back to engineering where they put it all together. By the end of the EEO, students have a good sense of whether the entrepreneurial life is for them, and how they might engage in it. The Graham School of Professional Development understands the importance of small class sizes so that students receive meaningful and personal attention and feedback. Students learn in a classroom that encourages discussion and focuses attention on practical skills that readily transfer to professional and/or academic environments. All classes incorporate elements of practice in their curriculum so that students use what they learn to hone their skills. This course prepares students to negotiate the rhetorical, political, ethical, and interpersonal challenges of communicating in a professional environment. Instruction in the practical aspects of writing technical correspondence and reports occurs within the course’s primary emphasis on the development of the student’s communicative judgement. Students are asked to assess and respond appropriately to a variety of case studies and to present their analyses in acceptable oral and written formats of the kind they will encounter in the workplace. This course is also intended to provide a foundation for further study in communication through the Certificate in Professional Communication (CPC). Students who have completed RCM 300 or equivalent may take any of these courses (except 495) as humanities or general studies electives (consult your department), or complete 6 courses (18 credit units) which must include RCM 400, RCM 401, and RCM 495 to complete the Certificate in Professional Communication (CPC). The Certificate in Professional Communication (CPC) is a certificate of proficiency program that prepares students for a professional career by cultivating sound communicative judgment in professional practice. The program consists of six courses (18 credit units). All courses within the program have a rhetorical foundation and are delivered by faculty of the Ron and Jane Graham School of Professional Development, College of Engineering. The CPC replaces the Professional Communication Option (PCO), which was restricted to students in Engineering. Now that the program is recognized as a Certificate, anyone who meets the admission requirements can apply to join. This change means that the CPC is open to students enrolled in or have graduated from any other college. In addition, engineering students can begin the CPC while working to their engineering degree and then complete the CPC on a part-time basis after graduation. The EEO is a set of 8 courses that forms an optional addition to the B.E. degree. Most of these courses are currently delivered in the Edwards School of Business. The EEO capstone course, (GE 431 Engineering Entrepreneurship Capstone) is taught in the College of Engineering, in a small class environment. Typically, EEO students add one course per term in the third and fourth year of their engineering degree. Students then stay on for an additional term in 5th year to complete 2 additional courses plus the EEO capstone course. Applications are now being accepted for the annual Graham School Public Speaking Competition. The first place presentation will be awarded a prize of $1,000. 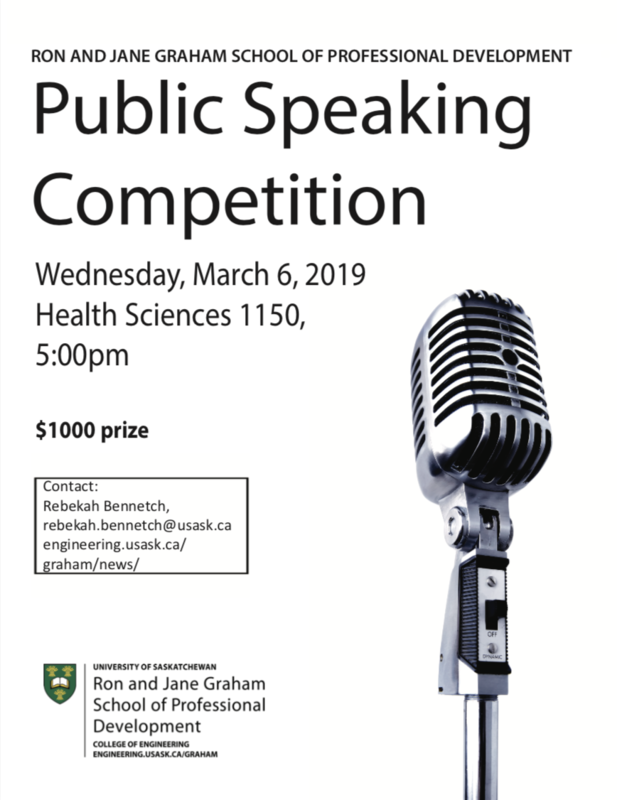 The speaking contest is open to any student registered in an undergraduate program at the University of Saskatchewan and who has completed RCM 300. The application deadline is February 25, 2019 and competition date is March 6, 2019 at 5pm.